Combustion Equipment for other applications. Another of E&M Combustión’s hallmarks is the manufacture of bespoke Combustion Equipment for different industrial applications, hand-in-hand with the customer. As an engineering firm, we are in a position to provide a technical solution to fulfil each and every need, regardless of the industrial sector in which our customer operates. These burners are used for starting up boilers of this kind and require a special design. We also make these types of burners with a retractable manifold system so that an air-lock trap system can be used to fully seal the equipment when the manifold is not in use and the boiler is operating. These burners are used in thermal fluid boilers and require a special flame for their perfect adjustment to the boiler. This kind of burners are mounted in a vertical position and operate with air temperatures of around 200 ºC. They are also low-emission devices. E&M Combustión makes industrial burners that operate with several types of gases at the same time. These include gases with a high H2S content, such as coke gases, and gases from the Claus process, etc. E&M Combustión, as an engineering firm specialising in the bespoke design of combustion equipment, places its technology at the customer’s disposal for its application in other kinds of processes requiring a burner. This includes incinerators, rotary sieves for asphalt plants, dryers, etc. 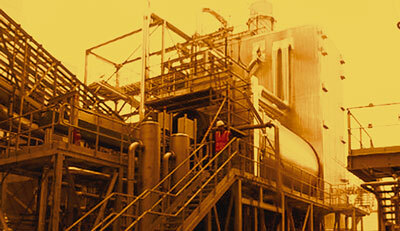 We make our technology available to ensure the success of our customers’ industrial applications.